Cornell class officers are a wealth of knowledge and experience. This month, we feature Doug Mitarotonda ’02, MEng ’03, PhD ’09, talking about the creation of Non-Reunion Reunion (NRR) events. Click here to watch all of the Class Officer Best Practice videos. Be sure to check back for frequent updates and reach out to your class Engagement Officer with any questions. Information about successfully governing your class including officer responsibilities, nominations and succession planning, the 5-year class life-cycle, and training opportunities. Create your profile and find communities and volunteer opportunities. Use this tool for class officer succession planning by nominating yourself or a classmate for class officer roles. Second decade alumni are 10 to 20 years past graduation. Join the conversation with classmates as they share best practices, articles, events, and the Leadership Lunch and Learn webinar series. Resources to facilitate connecting with your classmates including email communications, digital engagement, and affinity networking. Check out your class website for news about classmates, upcoming events, and memories of your time on the Hill. Check to see if you Net ID is active, search the directory for classmates or Cornellians, or update your profile. Keep your class website and social media up to date by sharing current content from today's Cornell. This support site is designed to be used by class officers as their source for training and technical help in iModules. Send your latest news and see your name in print in the Class Notes section of the Cornell Alumni Magazine. Whether your news is ordinary or extraordinary, your fellow Cornellians want to hear about it. Tools and information to assist with class dues solicitations, finances, classmate engagement statistics and Cornell Alumni Magazine. The Cornell Alumni Magazine was founded by alumni in 1899 and has been sustained and supported by alumni ever since. Published bi-monthly, it connects alumni, students, faculty, and parents to the University. Resources to plan and implement gatherings for your classmates, regionally and on the Cornell campus. Return to campus or find a Big Red party in your own back yard. Coordinate a class gathering around an ongoing Cornell event such as Homecoming, Sy Katz Parade, Red Hot and Frozen Apple Hockey, and more. University traditions bring us together no matter where we are or how long we’ve been part of Cornell. Learn more about these timeless celebrations. Registration for Reunion 2019 is open! Come celebrate with the undergraduate classes of the 4s and 9s at Reunion - June 6-9, 2019. 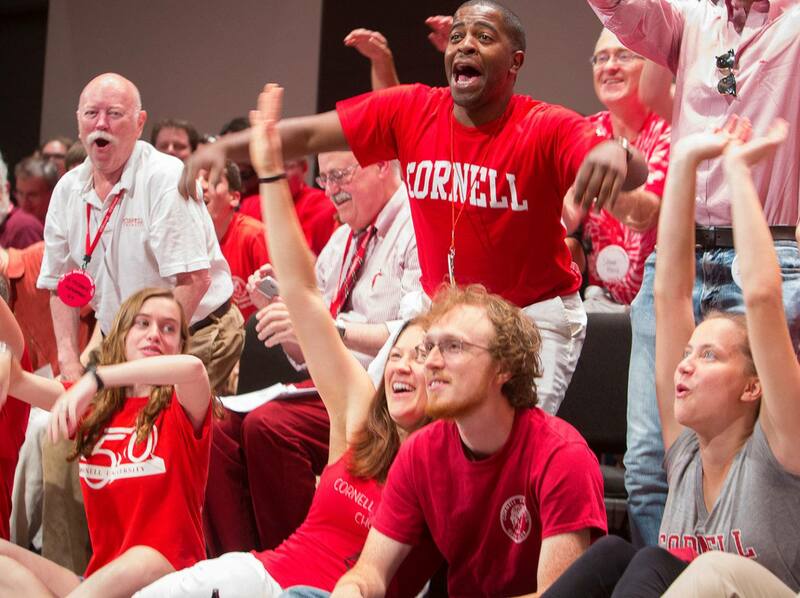 Whether you come alone with with your family, you will find Cornell Reunion weekend has something for everyone. Information about class-designated fundraising activities, Cornell funds, and scholarships. Every year, our volunteers reach thousands of their peers on behalf of Cornell, turning their passion for our university into generous donations and personal connections. Every year, Reunion draws over 7,000 alumni, families, and friends to Ithaca during the second weekend in June. Your class Reunion happens every five years. Whether you come alone or with your family, you will find that Cornell Reunion weekend has something for everyone.